The Nature Conservancy - The Nature Conservancy's mission is to 'preserve the plants, animals and natural communities that represent the diversity of life on Earth by protecting the lands and waters they need to survive' (mission from The Nature Conservancy magazine). The World Wildlife Fund - The World Wildlife Fund (WWF) is the world's largest privately-supported international conservation organization. The WWF aims to protect wildlife and threatened habitats. Greenpeace International - Greenpeace exists because this fragile Earth deserves a voice. It needs solutions. It needs change. It needs action. Since it began in 1990, the TD Friends of the Environment Foundation has proudly supported the efforts of Canadians who are dedicated to the well-being of our environment. World Conservation Union - The World Conservation Union promotes sustainable, ecologically-sound development practices while maintaining and protecting biodiversity. Visit their website for information about their conservation efforts. Wildlife Conservation Society - The Wildlife Conservation Society 'saves wildlife and wild lands through careful science, international conservation, education, and the management of the world's largest system of urban wildlife parks, led by the flagship Bronx Zoo' (from the World Conservation Society website). The Sierra Club -The Sierra Club's members are more than 750,000 of your friends and neighbors. Inspired by nature, we work together to protect our communities and the planet. The Club is America's oldest, largest and most influential grassroots environmental organization. National Wildlife Federation - Visit the National Wildlife Federation website for the latest news, conservation information, and research concerning wildlife and natural habitats. This organization unites individuals, policy makers, and businesses in an effort to protect the environment. Friends of Haleakala National Park - The Friends of Haleakela National Park supports 'educational, cultural, research, and service activities relating to the Haleakala National Park and its ecosystems' (Source: FHNP website). This stunning park, located on Maui's Haleakala volcano, is home to more threatened and endangered species than any other national park in the United States including the Hawaiian state bird, the Nene. The National Audubon Society - It is the mission of the National Audubon Society to conserve and restore natural ecosystems. Their efforts focus on birds and other wildlife and their work is aimed to benefit humanity and the earth's biological diversity. Ducks Unlimited - Ducks Unlimited 'conserves, restores, and manages wetlands and associated habitats for North America's waterfowl. 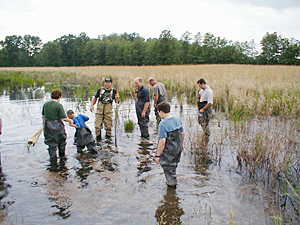 These habitats also benefit other wildlife and people' (mission from Ducks Unlimited website). The push for economic development has seen rapid urbanization, destruction of irreplaceable cultural heritage, and the destruction of many natural sites. Yet heritage preservation is not an obstacle to economic growth, in fact, it is a critical element of sustainable socio-economic development. In conserving cultural heritage, we are conserving those elements of our past that have the potential to contribute to our understanding of history on a local, regional and global scale. Historic sites demonstrate a communitys cultural continuity and long-term survival. At the same time, conservation also directly serves economic development goals. It is a productive activity which creates jobs and economic activity in the local community. Conserved buildings and structures not only reinforce the character of the historic town, but they can also be re-used or adapted for different purposes as housing, schools, health centers, and museums. Urban historic sites have significant potential for drawing cultural tourism. According to the World Tourism Organization, 70 percent of tourist revenues are spent in cities. In the 1960s and 70s, the world saw an unprecedented increase in tourist arrivals, particularly in Asia. Tourism has brought many benefits in the form of economic development and international exchange. At the same time, tourism has increased pressure on the environment, on local communities, and on cultural assets. However, heritage conservation is not incompatible with sustainable tourism development. There must be a well-thought out management plan which covers both tourism development and conservation, which is followed by all. Sustainable culture tourism implies increased investment to maintain and/or invigorate the cultural resources on which the tourism is based. Financing for this needed increased investment in culture can and should be found within the profit margins of the tourism industry. Innovative public-private partnerships can be established to link conservation efforts to sustainable tourism development. Although an increase in visitors to a site can bring economic benefits the increase in numbers of people is in itself problematic because of the additional stress it places on the already-fragile monuments. There is an upper limit to the number of visitors a historic/cultural site can receive at any one time without the site suffering permanent degradation or damage. It is both desirable and possible to expand both the carrying capacity of a site and the touristic interest of a site by integrating intangible culture with the physical heritage. Investment in training and human resource development in the performing and other traditional arts is, therefore, good tourist economics. Personnel, drawn from the local community and trained in the in-depth presentation of a cultural site as well as in its maintenance is crucial to the successful development of cultural tourism as a sustainable business. the six millon acre Adirondack Park in Upstate New York!